When you think pumpkin ale and Shipyard Brewing, the first (and only) thing that jumps to a lot of people's minds is their Pumpkinhead Ale. Smashed Pumpkin is an entirely different beer brewed with Munich Malts and the hops used in this one are Williamette and Hallertau, which are supposed to be spicy and work well with the pumpkin flavor. Pours a copper-colored orange that is very clear. You could probably see through this and pass an eye exam. Some mild carbonation and it produced two fingers of head when it was poured. Smells more like squash than actual pumpkin. The biggest spice I get is nutmeg with a hint of cinnamon. It tastes sweet, but not too sweet. It's more pumpkin than squash on the first sip. It has a very light taste almost like a wheat ale, but at the same time it's all pumpkin pie on the finish. I don't detect any graham cracker crust nor do I taste cinnamon, but strong nutmeg is here throughout. I'm also picking up a very small spiced rum presence which leaves a slight warming sensation on the finish, but not what I'd call a strong alcohol presence. At 9.0%, Smashed Pumpkin drinks lighter than it's abv and goes down nicely. It has a bit more body and substance than typical pumpkin ales. The pumpkin pie flavors are there, but it isn't cloyingly sweet and while it drinks light and has a certain wheat presence, it isn't watered down and thin. As far as the style is concerned, it is better than your average pumpkin ale. 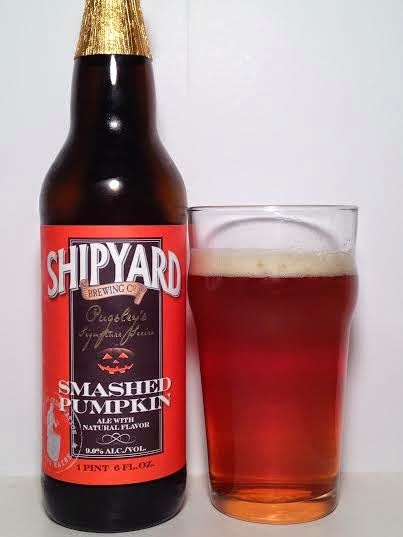 Those familiar with Shipyard Pumpkinhead should check this one out.